Greece, Eurozone Leaders Reach Agreement On A New Bailout : The Two-Way A frantic weekend of activity in Brussels resulted in a new financial rescue deal for Greece, preventing a near-term exit from the eurozone. 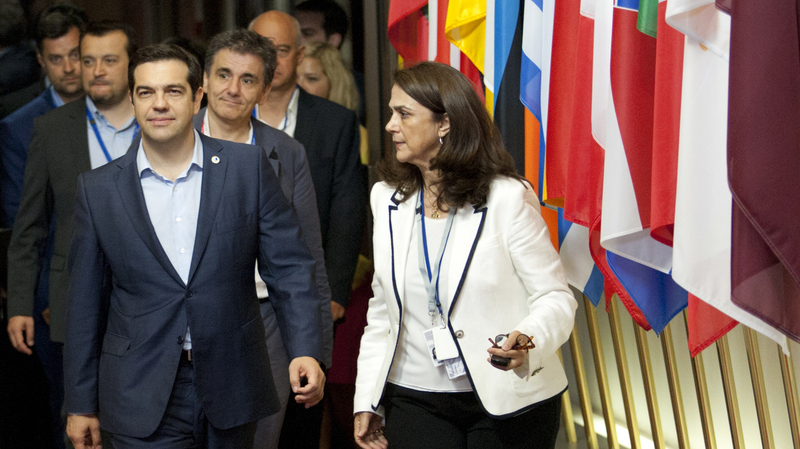 Greek Prime Minister Alexis Tsipras (front left) leaves after a meeting of eurozone heads of state Monday at the EU Council building in Brussels. The summit reached a tentative agreement with Greece for a bailout program that includes "serious reforms," removing an immediate threat that Greece could collapse financially and leave the euro. In a news conference early Monday morning, eurozone leaders announced that they would give Greece another bailout — as long as the government of Prime Minister Alexis Tsipras manages to implement a round of austerity measures in the coming days, says European Council President Donald Tusk. The new deal estimates that Greece will need up to $96 billion in emergency funding in the next three years, Jake Cigainero reports for NPR. Lawmakers in Athens by Wednesday will need to pass pension overhauls and sales-tax increases that voters overwhelmingly rejected in a recent referendum. As recently as Sunday, the two sides were reported to be far apart on a bailout, NPR's Soraya Sarhaddi Nelson reported. The German finance minister even suggested booting Greece off the euro for five years while it sold off assets and got its house in order. Those measures appear to be off the table for now following a marathon 17-hour negotiating session that ended with Monday morning's deal. But NPR's Joanna Kakissis told Morning Edition's David Greene that Greeks were greeting the news cautiously. "I talked to this young couple — she's a food inspector and he's a medical informatics researcher — they had wished that the government had actually had a Plan B, you know, a really lucid plan to exit the eurozone. Because that would have helped their negotiating position. "And they said that, had that happened, had people been given a really clear sense that, 'You know what? If they give us a horrible deal, we will have a Plan B,' that Greeks may have been actually more supportive of a eurozone exit. "But because there was nothing else but 'take this terrible plan, or eurozone exit — and we don't know what that's going to look like,' the Greeks said, 'OK, fine, we'll see where this goes, but we're still really scared about what's going to happen.' "